The city of Yazd has a long history of fine textile weaving, in particular hand-loom silk fabrics. Due to the arrival of machine-made fabrics, weavers in Yazd started to learn and practice carpet weaving instead. The use of fine weave, soft wool and designs in Yazd’s Persian carpets is very similar to Kerman carpets. Kerman is the closest large city to Yazd and most famous for its fine Persian carpets. Similar to Kerman rugs, the warps and wefts are cotton in Yazd carpet productions. In the early years of production (late 19th Century), designs were inspired by Kerman and Kashan carpets (another famous town in central Persia with long history of fine Persian carpet production). However, after the Second World War and the increased demand for Persian carpets in Europe and United States, Yazd weavers with the help of Kermani merchants developed new designs to build a new market for their own goods. Nevertheless even after this transition, Yazd Persian carpets were still inspired by Kerman motifs with better colours, finer weave and increased pile density. Persian rug designers and weavers in Kerman were enticed by higher wages by merchants in Yazd to move there to produce better quality rugs than their southern rival city of Kerman. Yazd Persian carpets are mostly woven with wool imported from Kerman and occasionally seen with silk inter-touch. 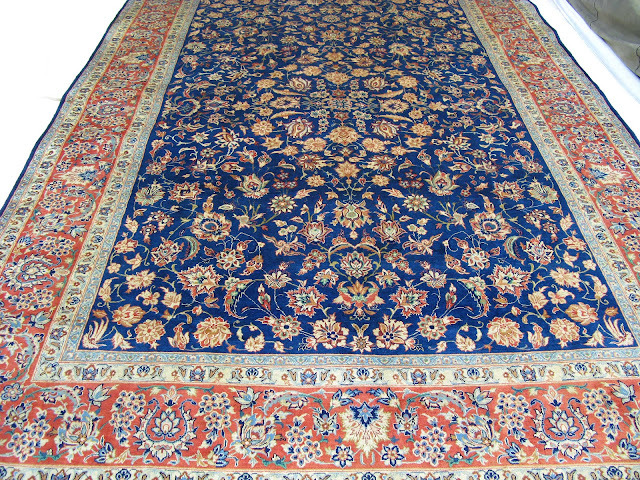 Carpets from Yazd are cottage industry weaves (use of home looms) and mostly in larger sizes.